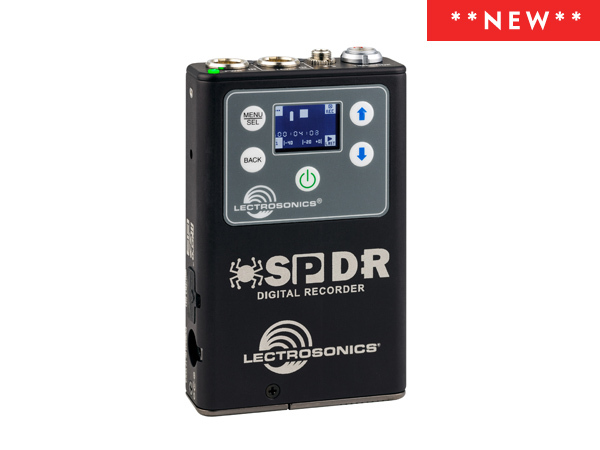 The SPDR is Lectrosonics’ response to customer demand for a small, lightweight dual channel recorder for use on virtual reality sound captures or as a backup recorder for bag systems in the field. The SPDR allows capture of the full stereo audio of an extreme sport participant, in-car scenes or in situations where a wireless system isn’t practical. When used in conjunction with a small mixer and the SRC receiver, the SPDR makes for a lightweight interview setup that provides full redundancy – all fitting into a small fanny pack. For compatibility with a wider range of memory cards while retaining high reliability, the SPDR features a deep write buffer.